Like the latest technology today, the invention of photography created a lot of confusion for people who didn't understand how it worked. And because of that confusion, many people saw ghosts in photos. Of course, once you understand how exposures work, and how negatives are created with light, it all makes sense, and there really aren't any ghosts in the photos. But without that, the blurry images that people saw were seen as obvious proof of ghosts. 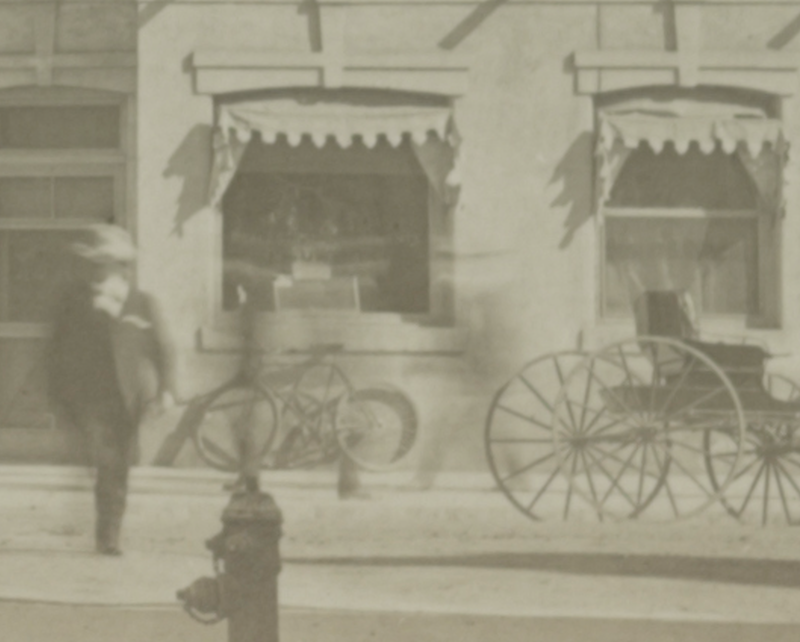 In the photo above, of Central Avenue and Adams in 1908, there are two "ghosts" that can be seen. On the left is simply a man just walking across the intersection, but to the right are two very ghostly images. One looks to be walking to the right, and the other one to the left. This must have been very frightening for people to see in 1908! Of course, all that's happening is that the people in the photo are moving too quickly for the camera, which had a very long exposure time (the time that the lens had to be open to capture the image) was able to capture clearly. The other things in the photo, like the buildings, the fire hydrant, the bicycle, the buggy, are clear, as they weren't moving when the photo was taken. I collect old photos of Phoenix, and I see a lot of blurred images that, if I didn't know any better, were evidence of ghosts. Or poltergeists, or wraiths. Old-time Phoenix was filled with ghosts! To me, it's no coincidence that the growing popularity of photography coincided with the growing belief that ghosts were all around. Then, and now, ghosts were big business, so many people pointed to these images as proof. But they were just blurred moving images in a photo. Whether you believe in ghosts or not, most people are no longer fooled by these blurred images. And I ain't afraid of no ghost - but I don't think I'll be staying at a haunted hotel anytime soon, just to be sure. Thank you for ghost hunting with me!